If your organization relies on SharePoint Online to implement your collaboration strategy and enable employees to share and manage information, then you must be aware that its underlying cloud infrastructure makes SharePoint Online hyper-vulnerable to both outsider threats and bad actors from within. Any change to your site permissions or unauthorized read access event can turn into a security breach if you don’t catch it in time. Only a reliable SharePoint Online reporting tool can help you stay on top of what’s happening in your SharePoint Online by providing reports enriched with valuable insights that enable you to spot, track and neutralize data security threats before they cause any damage. 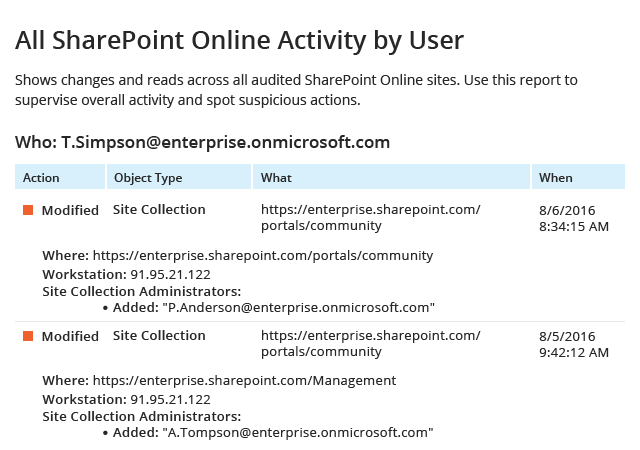 To help you mitigate the risks of unauthorized data access or site changes, Microsoft Office 365 offers some built-in SharePoint Online reporting and alerting functionality. But the out-of-the-box SharePoint Online reports are limited, which means you must manually sift through mountains of audit log data in order to find answers to your specific questions or dig deep to find the root cause of an incident. Plus, every time you need a report, you’ll have to generate and export it into Excel format, because no subscription options are included. Are you ready to spend your precious time on this when every minute counts? Looking for a way to harden the security of your critical SharePoint Online data and ensure that no unauthorized action slips by, while at the same time simplifying reporting? Kill two birds with one stone with Netwrix Auditor for Office 365. The solution empowers you with SharePoint Online reporting that you can rely on, and delivers the transparency into activity you need for true peace of mind. Better secure your assets with top-to-bottom visibility into who made what changes to your sites, lists and more, as well as who deleted a farm configuration and when and where it happened. Control privilege escalation by tracking how permissions are modified across your SharePoint Online environment and thereby making sure no users gain access to documents and lists they should not view. Slash reporting preparation time with detailed predefined reports that you can easily subscribe to and have delivered on the schedule you specify. Stay informed about risky activity with custom alerts on threat patterns. Keep your consolidated SharePoint Online audit data securely for years in the cost-effective two-tiered storage (SQL database + file-based) and access it easily any time when your next audit or in-house investigation comes around.